I want you to live each day intentionally, fully self expressed quirks and all so you can own all the parts of you and shout it from the roof tops. Be as healthy and happy as possible so you can get to know yourself as a whole being rather than a half! I'm a passionate AF woman with a deep connection to my souls voice, wivesy and a mumma of two wee boys that doesn’t sugar coat a thing i’m as real as they come you feeling me! I want to be surrounded by more epic and elevated humans who hear the call of their soul and don’t shy away but step up and say YES to living an extraordinary life! When I say passionate AF I mean PASSIONATE, I have come from a life that wasn't the healthiest or happiest by any means and I completely turned it all around every aspect of it, not in a day but by 1 simple and small decision to give this life all i’ve got. So I know that you can make that choice too at any moment if you want it bad enough. When you choose to start listening to your body, your heart, and your soul, you know what I mean right... You start to hear the call of that voice deep within! Many years ago I made a choice to remove chemicals and toxins from my home and live a conscious, healthy, and intentional life, life transformed for me it was the domino effect and slowly that small changed turned into a BIG change that has has the biggest IMPACT on my life, my happiness, my body, and my health and wellbeing. Those decisions have landed me here coaching and teaching women and men globally about the power of mother earth's finest Essential Oils and sharing my very honest and real whole living journey so that we can all live the life we were meant to live. For us to really get to know each other and to form a true connection, it is important for me to share with you how I got here… and how I now live a meaningful and purposeful life in true alignment with who I always knew I was meant to be! Don't get me wrong I am still human and I am far from perfect but I can honestly share with you that the Shannele I am now is who I always knew I was meant to be. I am now in a place where I give myself permission to be fully self expressed and authentic, I love the woman that I am and all the parts of me even if somedays I F### up and I let my ego get the better of me I acknowledge all of me, it's taken years and years of work and let's be honest when you open pandoras box and choose to be a conscious participant in your life and walk the path of self awareness and discovery this is an ongoing daily practice. Being a teenager was a difficult time for me as my home life was so destructive and volatile. Going through puberty was pretty awful as I was one of the later girls to get my period and my real mum wasn't around that much at this pivotal and life changing time in my life as I was transitioning into womanhood! I feel like I went off the rails and started the negative self talk and started to treat myself and my body with no respect or love, at 12 years old I felt like there was always a part of me and my body that wasn't good enough. I would sit alone some nights in my room and draw with black marker pen all the parts on my inner thighs that I wanted the weight to melt away from It's so ludicrous to think of my 12 year old self doing this as I was sending the message to myself that I wasn't good enough the way that I was. Years went by and of course I out grew lots of my "stuff" my hangups but at the same time I can still remember the little comments or remarks I would constantly say to myself about my body and it was hurtful and mean. So after a few crappy relationships, loads of self help books, and a bit more self help thrown in I started to like myself and years later after more sabotaging relationships and more binge drinking and take away foods I started to really get to know myself, I slowly started peeling back the internal layers I began to really like myself in my early 20's and even love myself after louise hay kept showing up in my life and I started practising mirror work and daily affirmations. By the time I packed up my life at 21 and headed overseas alone that's were the internal growth really started to show up in my life. By travelling the world and being the loneliest I've ever been, those were the moments I discovered parts of myself that needed more love and attention. I started making self love rituals part of my daily routine, with affirmations posted on every wall in my room, and looking deep into my eyes until I locked eyes on my soul and I spoke to my inner child and my inner teenager. I would cry as I told my younger self I loved her. After a few more years travelling and enjoying and owning the woman I had become I met my hubby in London and by that stage had worked through a massive chunk of my baggage thank goodness, I married my best friend my one my person. We were two seperate entities coming together and building a beautiful relationship with one another which would have us living an extraordinary life together, making our dreams come true one by one. After 6 years together, 2 years married countless countries across different continents, a house, and all the joyous time in-between hubby and I decided to quit our jobs, pack up everything we owned and back pack the world for just under 15 months for our year of fun before settling down whoop! Our trip changed everything, dōTERRA entered my life 3 years ago, when I decided it was time to change my lifestyle and reconnect with my own body and intuitive self as a woman. On our year of fun backpacking the world with my hubby, we were almost at the end of our South American leg of our trip on a 24 hour bus ride from Peru to Boliva in the middle of nowhere when the pain in my stomach and body started to become excruciating, still a couple of hours away from reaching our final stop I had no idea what was about to unfold. We hadn't even been in Boliva for an hour and I had to be rushed straight to a Bolivian hospital in a speeding taxi. It turned out I had been bleeding internally for 24 hours and I needed an emergency operation in a third world country (What a story to tell everyone). I wasn't sure if I was going to loose all of my womanhood, the doctors all spoke Spanish and very little English and all we could understand was something about my uterus and ovaries, at that point to say that hubby and I were afraid and scared was an understatement. I was rushed into an elevator with a nurse crossing her chest in prayer for me without my husband as we made our way to the basement of the hospital for an emergency surgery. It turned out I had a burst ovarian cyst and there was 250 mls of blood in my body cavity that needed to be drained and removed immediately, apparently I was being watched over by my angels that day if we had been any later I would have potentially lost all of my baby making organs or died. I spent the next ten days recovering in a hospital bed with a tube hanging from my pelvis with a rubber glove capturing all the blood and a piece of twine sealing the glove to avoid any leaking (Yep that's how they do it there). I realised in my time in the hospital as I couldn't move off the bed I was wearing an adult sized nappy and having my VJJ doosh bathed with a pair of metal tongs and a kettle over a metal bed pan (Dignity zero and humiliation at an all time high). With all the time I had to think in the quiet moments I discovered how disconnected I had become from my body and from my truest self. The whole experience shook me to my absolute core, it really hit my hubby and I quiet significantly as one of our biggest life dreams together was to make babies with one another and start our own wee family. My whole journey allowed me to reflect and get crystal clear on what I was doing to my body unconsciously or subconsciously and It was time to start respecting myself and treating my body with the love and kindness that it so rightly deserves so that I can be the healthiest and happiest version of myself and live extraordinary. 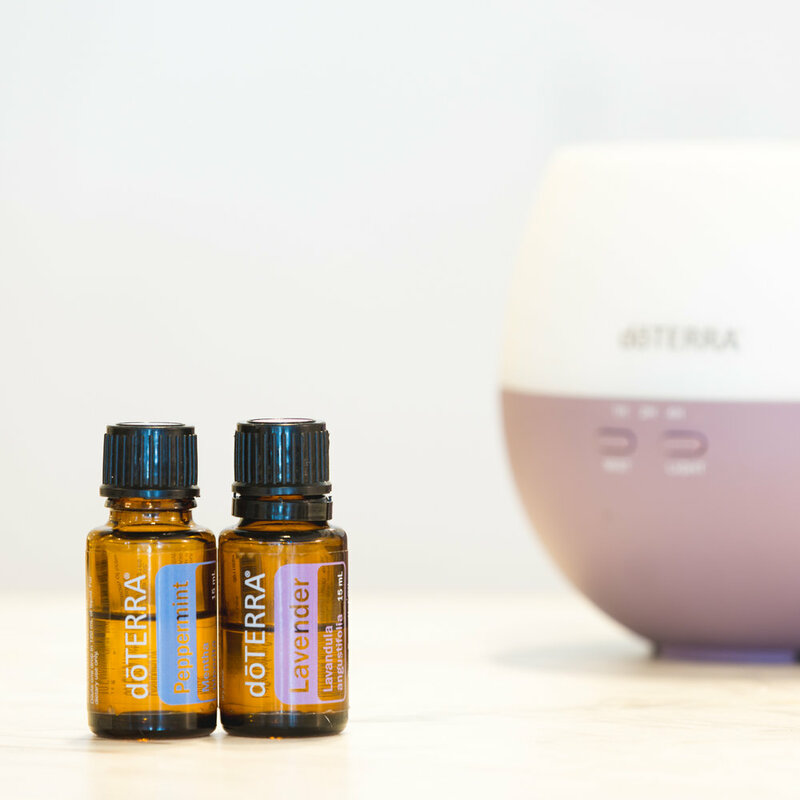 I educate and support women and men with the pristine and pure dōTERRA essential oils who are ready for change and are ready to make their health and wellbeing a priority . I am an intuitive Natural health and life coach with 3 years experience using essential oils in my life for a number of benefits such as balancing my hormones and supporting my mood, low tox living for myself and my family, and deepening my spiritual practices there is so much more but I'd be here all day listing them off. The oils have not only supported me in my ongoing wellness journey but I have been privileged to have helped a number of people in their journey to a healthier and happier life. Essential oils have been used for thousands of years for their therapeutic and healing properties. In simple terms, they are extracted from plants' leaves, stems and roots and contain tiny organic molecules. I remember as a child my mum was very much into wearing essential oils as pure fume, I'm not sure of the quality of them. Every time I take the lid of my essential oil bottles I am taken down memory lane. We used to use essential oils for everything back in the day it was a less is more mentality and as the population has grown the ease of not making our own products has meant that we rely on big companies to make all our products that are filled with so many chemicals that are causing so much havoc with our natural state of being and breaking down our bodies ability to do what it is so cleverly designed to do. My favourite oil (if I can pick my favourite), is Frankincense. Oh Franky! Not only does Frankincense support me during times of stress, but he also helps me get rid of my mumma stretch marks. It's a sacred, powerful oil and I use one drop under my tongue every morning. Franky is also my meditation companion...how can I not love this beautiful oil? Lavender and Roman Chamomile are my go-to when Nate or Chase my babes, can't sleep or are agitated. I also love lavender for the smell, the way it makes me feel and for a quiet moment. I could keep going on and on about every single oil and why I love them all. But what I'd like to do is sit down with you and understand which oils you most need NOW. We always start with a few, or we intuitively pick one because that's what our body needs at the time. I love supporting my sistas; and because I have supported my health with oils during my two pregnancies, I often get asked by mamas how to go through a healthy pregnancy with the support of these amazing gifts from mother earth. dōTERRA crack your heart open with their philanthropic heart and generosity, as a company they are always looking at new ways to give back to the world in which we all co exist. dōTERRA work and collaborate with communities and local farmers to create sustainability within those villages and communities, dōTERRAS partnership with the communities and villages across the globe allow for our oils to be sourced from where the plants are indigenously grown and harvested, this means that the oil is at it's purest, potent, and most effective. Our oils are 100% free from fillers, synthetics pesticides and fragrances just pure mother earth at her finest in every bottle. Don't worry, I won't spam your inbox!